Much like Tutubi's hometown Paete in Laguna province, Angono is sandwiched between the rugged slopes of Sierra Madre mountain range and Laguna de Bay. 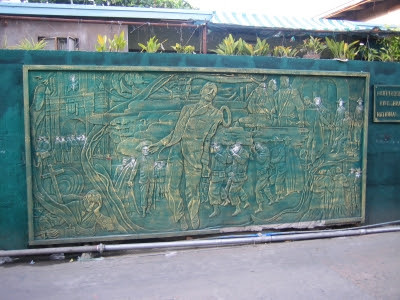 The two town's people also share the same gift of transforming ordinary items into extra-ordinary works of art; Paete is touted as the Carving Capital of the Philippines; Angono as the art capital of the country. 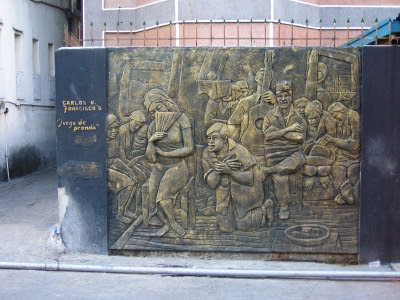 Some time ago, Tutubi, along with R and O, decided to take a daytrip commuting to Angono to see for themselves the fabled artists of the small Rizal town noted for its artists including two National Artists: Carlos "Botong" Francisco and Lucio San Pedro. Meeting up at EDSA Central terminal, Tutubi and the gang of intrepid explorers available at a moments notice for unplanned trips, boarded a van (FX) bound for Angono. The trip was pleasant one, passed by the fork on the road where "Ang Nuno" greets all passers-by, and alighted at Angono public market; the gang transferred to a waiting tricycle that took them to Balaw-Balaw Restaurant, once (in)famous for serving "exotic" fare that includes usa (dear), sawa (python), baboy damo (wild boar) and bayawak (an endemic and endangered lizard), but now serves highly palatable Filipino dishes with a serving of the signature balaw-balaw appetizer. 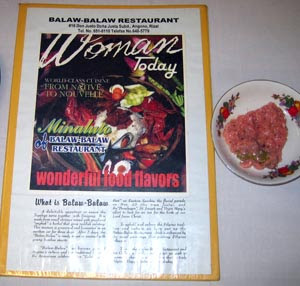 Balaw-balaw is actually an Angono native sauce made from fermented shrimps, red rice and a porridgy base. The gang visited Nemiranda Arthouse with its figurative realism artworks, had merienda of halo-halo and sinful pasta with aligue (crab fat) sauce at Nemiranda Art Cafe and Restaurant before boarding another tricycle to the street lined with re-interpretations of Carlos "Botong" Francisco's works. Higantes Festival, November 23, where higantes (giants) made of papier mache are paraded around town in honor of San Clemente (St. Clement), the town's patron saint. The Arthouse, like a labyrinth, environment-friendly architecture concept where a wide collection of the artist's paintings using figurative realism in the artworks portraying rural life and folkloric art. 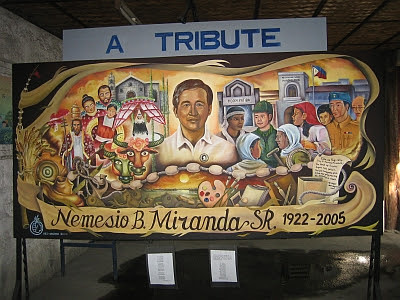 One of Nemiranda's most visible work are the murals inside the EDSA Shrine, EDSA corner Ortigas Avenue. A painter, a musician and transmedia artist Orville Tiamson depicted Philippine culture using modern cubist style. 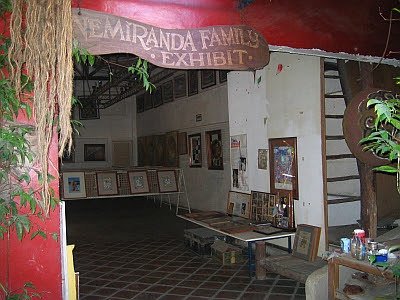 The museum displays the incredibly life-like paintings of the most famous family of painters in the country. The gallery houses Pepito Villaluz’s unique graphic and much-detailed realistic style. 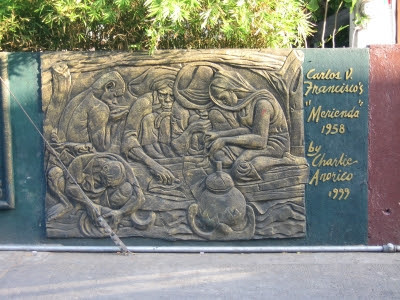 One of the most prolific and talented students of the late National Artist Carlos “Botong” Francisco. The private studio displays the works Salvador Juban. style ranges from the early "realistic" to the more recent "conservative-imaginative realism in transparent cubism." A vast collection of paintings, sculptures and other art froms conceptualized and made by independent and budding artists from Angono, the gallery is located at Balaw-Balaw Specialty Restaurant, where customers, visitors and guests alike, oftentimes enjoy viewing the artworks on display. Commute: At EDSA Central, there are vans/FX that'll take you direct to Angono. Travel time is about an hour. Alight at the town market and hire a tricycle to take you to your desired destination, if far. There are also jeepneys in Cubao plying the Angono route. Coming from Pasig, take the Manggahan Floodway along Pasig River; make a left turn at the end of the Floodway; right turn at the junction towards Provincial Road. A left at the junction towards Manila East Road (where you see some Giant Sculptures) takes you to the Nemiranda arthouse. A right turn will take you to the town proper. I like the carvings on the turf. Really beautiful! My aunts used to bring lots of these shapr curvings from Manila...I bet some of them were from Angono or Paete. Nowadays, I rarely see those wooden statues in houses---perhaps they've become too rpicey fro the common buyer as their quality increases. uy sarap naman ng mga pasyal mo ang dami mo nang na visit. heheheh salamt at lagi kami nakakasama pati sa kainan sa susunod ulit. I've been always interested to the artworks of Angono. I have a friend who lives there and he really has a talent in arts. Angono is such a blessed city for having wonderful artists. bayawak is monitor lizard. it's endangered? i thought there's still a lot of them here. 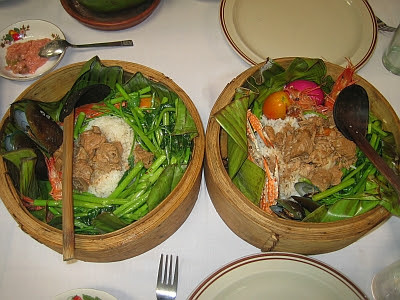 we also have balaw in bicol, but i'm not sure if it originated there. kyels, you pronounce Paete the way a Malaysian would and you're close. Filipino has the same roots as Bahasa. I am a friend of Mari and found your site at her blog. I agree Angono is a blessed city for having wonderful artist. When I was an art student at the U.P. "Botong" was one of my favorites Filipino artist. Thanks for the photos about him. Nice reading an update about his life. Very very interesting place. I've never been there either. But that place really shows how artistic we Filipinos are. Hi! =) ganda ng mga napupuntahan niyo sana makapag-post rin kayo ng rates para kapag may gustong pumunta alam na yung budget..hehehe ..
by the way whats the name of the park in angono with cave?? ?